The best way to learn about characters in a given role-playing game is to generate a character. As such, we shall endeavor to create a Space Opera character in this and subsequent posts. The first step is to choose a class from among the following six: Armsman, Tech, Research Scientist, Medical Scientist, Engineer Scientist, and Astronaut. Let's go with Astronaut. For the most part, the definitions of the personal characteristics are intuitive. Empathy, however, is defined as “the unconscious and largely uncontrolled broadcast of a character's personality aura and its interaction on auras of those around him.” We learn that a character with an Empathy score of 01 - 06 is “a man without a conscience in search of a personal, living 'god' to give his troubled life security and purpose, a sword looking for a strong hand to wield it.” Say what? The next step is to determine that nature of the character's home planet through a series of die rolls. A result of 11 an a d20 tells us our Astronaut is “a native of a planet with a standard 'Terran' gravity field of 0.9 G to 1.1 G.” This result allows a 50% chance of either +1 Strength or +1 Stamina. The percentile roll result is 33 and I elect to have +1 Strength. A result of 13 on another d20 indicates a planet with “an atmosphere of more or less Terran quality.” Planetary Climate is determined with a percentile roll. A result of 70 establishes our Astronaut's homeworld as Planetary Type 2: Terran Planet without Seasonality. Assume hydrographic features cover 50% to 75% of the planetary surface. The climate will vary considerably over the entire surface of the planet, but fixed and unchanging belts of climate occur. Inhabitants will tend to pick the most favorable and comfortable zones to be settled, making forays into the hinterlands. As water tends toward the 75% of surface area range, the equatorial and tropical regions develop dense jungle belts. As the water tends toward 50% of surface area, the equatorial and tropical regions tend toward desert. 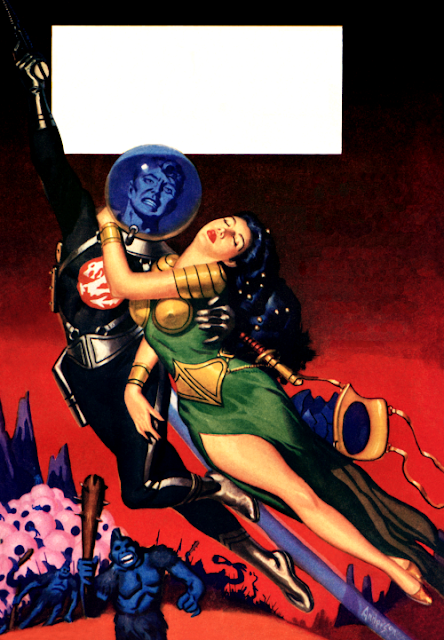 “Once the personal characteristics and the planet of birth have been determined for a PC,” section 2.3 explains, “the player will have to decide on the interstellar race to which his character belongs.” To belong to a particular race, a character must conform to specified characteristic minima/maxima and come from an appropriate planetary type. The default option, naturally, is human. We learn that “Humanoids are representative of human races who evolved from the basic racial type during the long isolation of the Interregnum between ForeRunner Civilization and the rise of the current starcultures.” Presumably, the ForeRunners are the Space Opera equivalent of the Ancients in Traveller. Transhumans “seem to represent individual evolutionary mutations pointing toward a new stage of [human] racial development.” There are, however, two Transhuman races, the members of which are Vulcans with the serial numbers filed off. Our Astronaut does not meet the requirements for any non-human race other than humanoids or Avians. Really, who wants to be a humanoid or an Avian? Height and Weight are derived from from a character's Physique score. A chart is consulted based on gender and race. A male human with a Physique of 11 is 180 cm tall and weighs 80 kg. However, the +1 Strength bonus obtained earlier causes an increase of body mass by 5 - 10%. A roll of 1d6 results in a 2, so there is an increase of 6%. The modified weight is therefore 84.8 kg. The CC racial factor for humans is 0.05. As such, our Astronaut's Carrying Capacity is 51 kg. The DF racial factor for humans is 2.5, indicating a value of 30 for our Astronaut. The SF racial factor for humans is 3.0; therefore, the character's Stamina Factor is 75. In the next post, the character will engage upon a career. The cover depicted above is the last of three versions. (All versions can be seen here.) This third version (by Bob Charrette) is based upon the second version (by Gene Day). With the third version we lost cleavage and a goofy-looking alien, but at least we gained a kitty person, a lizard person, and a robot. Both versions feature something which is NOT a Wookiee posed against the backdrop of a small moon. Wait...that's no moon. 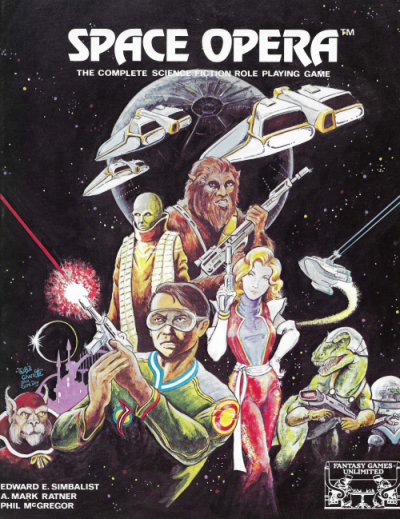 To be fair, the game's Introduction claims it was partially inspired by “Star Wars from George Lucas.” There's even a field of psionics called the Force, having both a light side and a dark side. The goal is to keep the action moving. Dice rolls which serve only to take the StarMaster or the players 'off the hook' by replacing good role-play with a mechanical toss of the 'idiot dice' will tend to slow down the tempo. For suspense, roll the dice and build up the tension by a lot of talk while doing so. When the very fate of a player is at stake, dice rolls are again useful to give a 'fair' probability that the character will survive or be successful. (In the latter case, an arbitrary ruling or even a perfectly correct ruling of the StarMaster which brings a character to disaster, can often breed bad feelings.) The dice can act as an insulator and keeps things a bit impersonal. He must be fair, interpreting the spirit rather than just the letter of the rules. He must avoid personal involvement himself – a sometimes difficult thing to do because his role as the neutral opposition to the characters can occasionally bring out his own competitive spirit. But he must suppress this because, as referee, he holds all of the cards and can subconsciously 'rig' events to suit himself if he is not careful. Such neutrality is essential, for one of the tasks of the StarMaster is to act as a neutral go-between when characters secretly or individually act behind the backs of their comrades or set themselves up in opposition to the very Authorities in power – NPCs whom the StarMaster controls. The character record sheet included with Space Opera is arguably the blandest character sheet ever published. It doesn't even display the title of the game. Conspicuously absent is a disclaimer granting permission to make copies for personal use only. Given how unlikely it would be that anyone would pay money for this thing, such a disclaimer was apparently deemed unnecessary. A bland character sheet is not necessarily a bad character sheet, but the organization of the Space Opera character record sheet leaves much to be desired. There are fourteen Personal Characteristics, including three Aptitudes: General Technical, Mechanical, and Electronics. On the character sheet, these Personal Characteristics are interspersed with 'Secondary' Characteristics without rhyme or reason. Furthermore, Space Opera is a skill-based game. 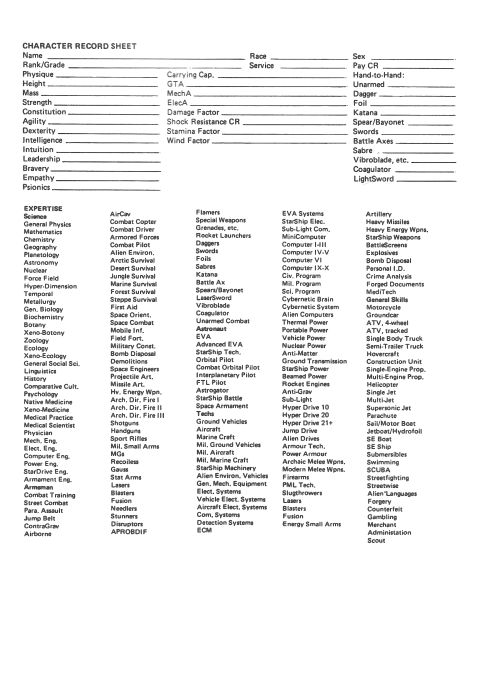 Some skill-based games have character sheets that list all (or most) of the game's skills. This is fine and well if there are less than a hundred skills and they are presented in some sort of order. Space Opera has over a hundred skills and they are listed on the character record sheet. These skills are sorted into five types, but there is no alphabetization within a type. Really, you're better off with a sheet of notebook paper. In 1987, TSR published the board game GAMMARAUDERS, “a wahoo brawl of world conquest and spiffy weapons with fins!” Inspired in part by the Gamma World franchise, GAMMARAUDERS takes place in the post-apocalyptic Gamma Age. As the above quote suggests, the premise was not entirely serious. In the game, players control giant, cybernetic animals called bioborgs. 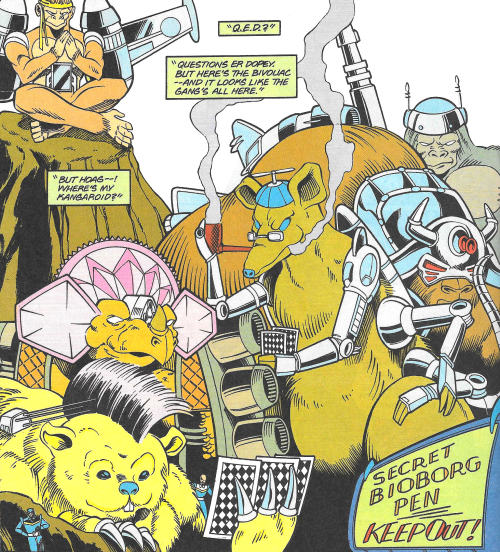 The bioborgs fight one another as well as more conventional military forces (known as 'popcorn'). Cryptic Alliances are also part of the game; functioning as factions. 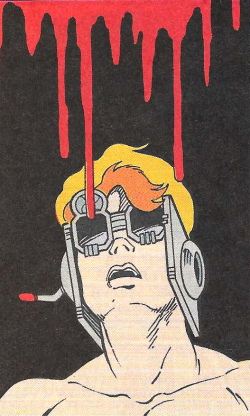 However, the GAMMARAUDERS Cryptic Alliances are not the same as those in Gamma World. Included with the game was a twenty page booklet “of bioborg background, Cryptic Alliance news, and world history.” It was an interesting decision to include twenty pages of unnecessary background details for a board game. It's almost as if the publishers had additional plans for the setting. Given the reasonable assumption that a significant amount of overlap exists between comic book readers and RPG enthusiasts, DC Comics published a few official Dungeons & Dragons titles in the late 80s. Also published was a GAMMARAUDERS comic book, initially written by Peter Gillis. How many comic books have been based on board games? Anyway, the early issues included rules for The GAMMARAUDERS (Extremely Tiny) Roleplaying System authored by Zeb Cook (or, as he introduced himself, Major Zeb of the Gammarauders Science Patrol). So, we have a role-playing system published in a comic book based on a board game partially inspired by a role-playing game. The GAMMARAUDERS (Extremely Tiny) Roleplaying System (hereinafter GETRS) version of a Game Master is called the Boss in the first installment, but the Keeper thereafter. Each Player Character is a bioborg handler with five abilities. Abilities are the things that tell you what your Character is like. Each ability is rated 1 to 6. A 1 means you're just not very good in that area. A 6 makes you about the best there is with that ability. Roll 1d6 (ignoring rolls of 6) for each of five ability scores, assigning those scores as desired. It can be anything you want. Perhaps he can't abide the color red. Maybe she is touchy about her height. He can even loathe his own bioborg, forever envious of the fine creatures other handlers have. Choose something you can have fun with. The Gamma Age is populated by “factoids” that look like CRT terminals with robotic feet. They answer every question – completely and literally. Never, never ask a factoid what's new. It will follow you for the rest of your existence, displaying every new thing on its screen. Attempts to find out where they come from have proven equally futile. It is quite possible that factoids know everything in the universe. The problem is finding the right questions to ask. GERTS uses “the scientific principle known as Fistsfulls of Dice.” When a character “tries to do something difficult,” roll a number of dice equal to the appropriate ability. If the result of at least one of the dice equals the ability score, the character succeeds. Easier tasks increase the number of dice to be rolled; harder tasks reduce the number of dice. With regard to fighting, “You can do just about anything reasonable (and some things unreasonable).” However, “You can only do one basic thing (shoot, run, shoot and run, etc.) in a turn.” Initiative is determined by rolling against Control. The person who makes the most successful rolls (i.e. rolls his Control score) goes first and so on until everyone has a chance to act. If no one rolls his score, the person who rolled the most dice goes first and so on. If it is a tie, those characters do everything all at once. A weapon inflicts damage according to the results of a number of dice indicated in the weapon's description. For instance, a “Handy-Dandy Blaster Pistol” inflicts two dice of damage. When punching, kicking, or otherwise using your body, you do 1 point of Bod damage for each successful die roll you make. If your Bod is greater than your Rumble, you add one to this result. In GERTS, there are two types of equipment; handlers have Personal Equipment while bioborgs have Fittings. “Both types of equipment are governed by one basic rule: You have to make things up.” Each bioborg Fitting is either a Weapon or Defense. Give the item a great name by combining meaningless phrases to make something that sounds really powerful. 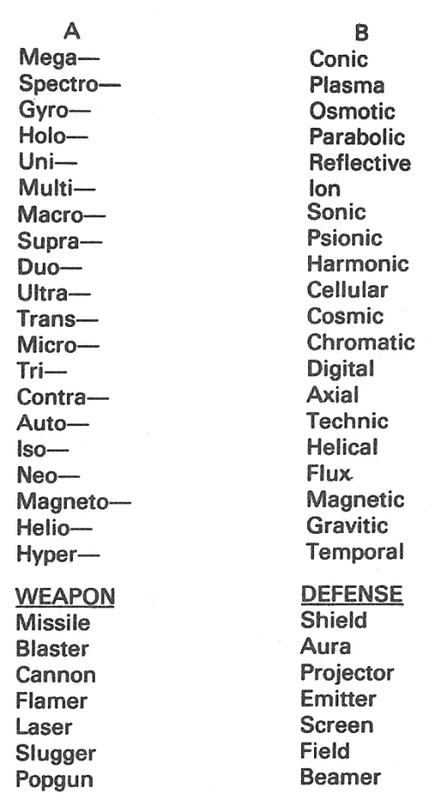 Choose one term from each of columns A and B, and combine these with the appropriate Weapon or Defense name.